The Normandy campaign saw the Anglo-American armies inflict a decisive defeat on the German military machine. The British Army's role was pivotal, but victory came at a price. Between D-Day and the end of August some 83,000 British, Canadian and Polish troops became casualties, of whom almost 16,000 were killed. These losses were a reflection of the nature of the campaign, fought against a tenacious and committed enemy obliged by Hitler to contest every foot of ground. Troops from the 6th Royal Scots Fusiliers in the village of Saint-Manvieu-Norrey during Operation 'Epsom', 26 June 1944. The strain of battle is apparent on their faces. The infantry faced the hardest of tasks, advancing against an almost invisible enemy, acutely vulnerable to machine guns, mortar fire and the sniper's bullet. They carry pickaxes on their backs, to help dig the slit trenches that were their only protection. The Allied victory is often passed off as the result of superiority in firepower, air strength and supplies. This is a simplistic interpretation. Right from the start, success also hinged on the morale and capabilities of the frontline troops, especially the infantry, who would bear the burden of the fighting. And nowhere was this more vital a factor than in British Second Army, fighting in the east of the Allied lodgement area. Men of 15th (Scottish) Division await the signal to advance during Operation 'Epsom'. 26 June 1944. The British were not as well versed in infiltration tactics as the Germans. Instead, they relied on traditional attacks behind a rolling artillery barrage to suppress enemy positions. Failure to keep up with, or 'lean into', the barrage meant troops were exposed to the full weight of enemy fire. By 1944 Britain was running out of soldiers. The campaigns in the Mediterranean and Far East, the war at sea and the bomber offensive had all drained her manpower reserves. The army that was sent to Normandy lacked for nothing except adequate reserves of fighting troops. Though well supplied with weapons, vehicles and equipment, Second Army could not afford huge losses, militarily or indeed politically. With vast reserves of US manpower now coming on stream, it was vital for Britain's interests and national standing that her field army was strong enough both to engage and defeat the Germans, and then also provide a sustainable army of occupation. Everything had to be done to minimize casualties and preserve the army's fighting strength. One who understood this only too well was the land forces commander, General Sir Bernard Montgomery. 'Monty' was a controversial leader, criticised by many, as much for his personality as for his handling of the campaign. But his operational methods reflected an acute awareness of the size and limitations of the army under his command. Much of it was untested in action, having spent long years training in the UK. Even his veterans lacked the sort of intense combat experience gained by many German soldiers on the Russian Front. Nor were his men imbued with the political and ideological fanaticism that characterised some German units, particularly Waffen-SS formations. 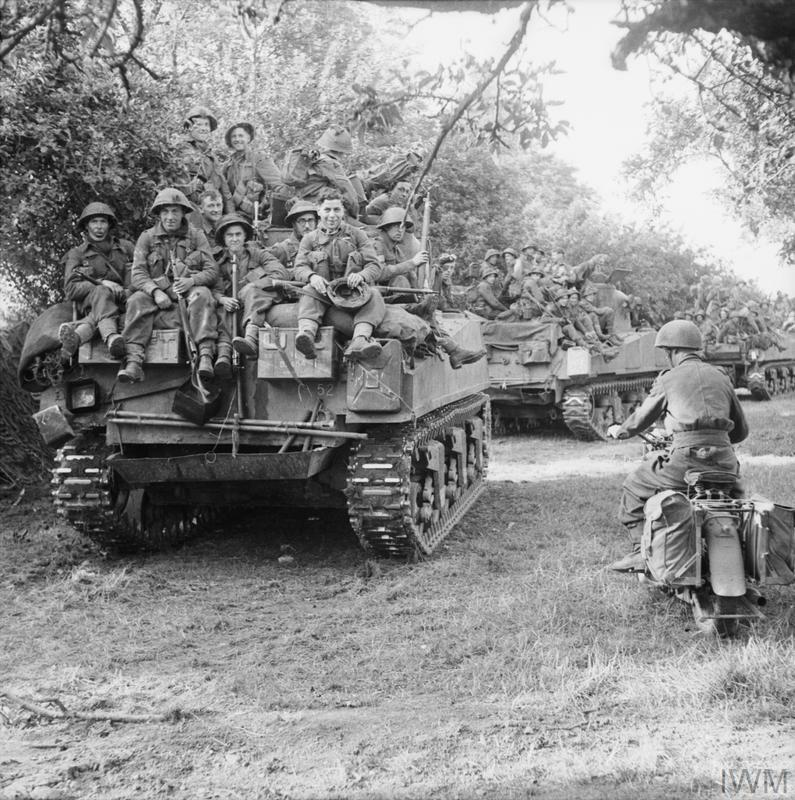 Sherman tanks of the Staffordshire Yeomanry carrying infantry forward during Operation 'Goodwood', 18 July 1944. Unlike the armoured divisions, the independent armoured divisions, the independent armoured brigades were primarily intended to function as close support for the infantry. As the Normany campaign went on, infantry increasingly took to riding into the battle zone on the backs of the tanks, 'de-bussing' when within range of the enemy. Montgomery was determined to fight a battle that minimised these weaknesses and made use instead of Allied advantages in firepower. He knew that the supply of replacement personnel would be limited. Keeping casualties to a minimum would be a priority. 'Let metal do it rather than flesh', as his chief intelligence officer, Brigadier Edgar 'Bill' Williams, put it. 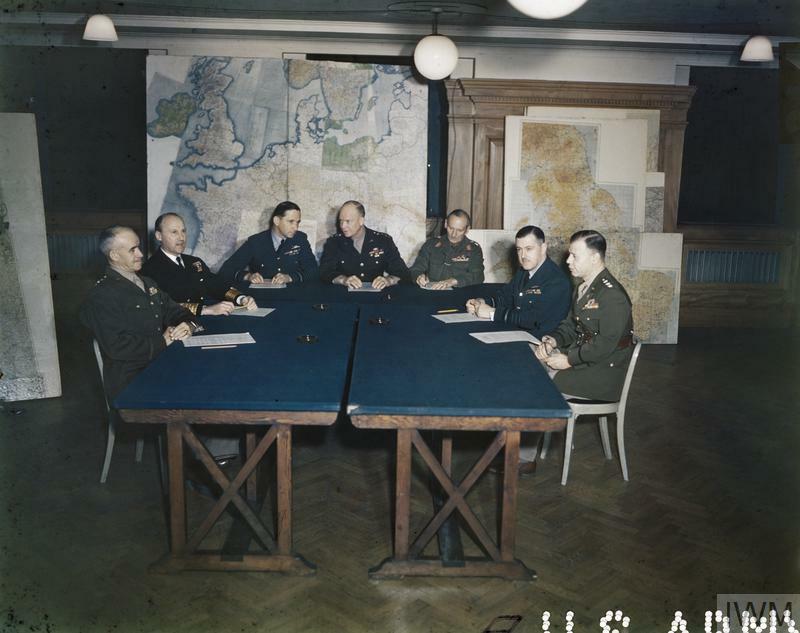 Above all, Montgomery sought to instil confidence and maintain the morale of his men, which he believed to be 'the most important single factor in war'. The capture of Caen was fundamental to the Allied plan. On 8 June Monty wrote 'I have decided not to have a lot of casualties by butting against the place.' So began attempts to envelope the city from east and west, but delays in getting forces ashore cost valuable time which the Germans used to bring in reinforcements and stiffen their line. Operation 'Perch', launched to the west of Caen, bogged down when 50th Division ran into stiff resistance around Tilly-sur-Seulles. In one action the 6th Green Howards lost 250 men trying to capture the village of Cristot. Their supporting tanks led the attack, but raced too far ahead, so that well-hidden German troops cut down the isolated infantry and then turned on the tanks from the rear. 7th Armoured Division attempted a 'right-hook' towards Villers-Bocage on 13 June, but this was also blunted by a fierce German response, not least by the intervention of a handful of SS Tiger tanks which decimated its lead elements. These failed attempts to outflank Caen were an early demonstration of flaws in British tactics, as well as the debilitating effect of the confined Normandy landscape and the impressive fighting qualities of German forces. 7th Armoured Division's previous experience of mobile warfare in North Africa did not readily translate to a congested European battlefield. With its infantry left too far behind, it had been stopped in its tracks in terrain unsuitable for the large scale deployment of tanks. In this environment the new handheld Panzerfaust anti-tank weapon was used to great effect by German infantry. It was becoming clear that attacks led by tanks were doomed to fail without proper infantry and artillery support. The armoured divisions started adapting to the new conditions by mixing tank and infantry brigades, but the successful co-ordination of the two arms was never entirely achieved during the campaign. Failure to breakout quickly from the bridgehead meant Montgomery needed to build up his own forces more quickly than German reinforcements could arrive. As the front congealed it was clear that his focus on Caen was drawing in the best German formations to its defence, thus facilitating the progress of American forces further west. But in so doing he was committing Second Army to a slogging match with the best of the German Army in Normandy, including nearly all the available Panzerdivisions. With finite resources of manpower available, such a battle of attrition could not be sustained forever. The Royal Navy battleship HMS Rodney providing fire support for the invasion forces, 7 June 1944. Spotter aircraft were used to direct her fire, which could reach up to 23 miles (37 km) inland. During Operation 'Charnwood' on 8 July, her 16-inch guns were successfully employed against tanks of 21st Panzer Division assembling south of Caen for a counterattack. It was therefore crucial that operations made as much use of Allied firepower as possible. Typically, attacks were preceded by huge barrages from a combination of massed artillery, warships offshore, and even heavy bombers. Then the infantry went in behind rolling barrages. Tanks were most successfully used when they were well integrated with the infantry for mutual support - not leading the attacks, but helping to 'shoot the infantry in'. Assaults on a narrow front allowed maximum concentration of firepower, and enabled follow-up battalions to quickly take over from the assault troops to preserve momentum. In such attacks, the rifle companies were bound to suffer heavily, because there was only so much the artillery, air and tank support could do. It is an inescapable fact that attacking troops are always more exposed than the defenders, and the Germans became adept at using mortars to bring down concentrated fire. These weapons caused three-quarters of British casualties. British tanks were also acutely vulnerable, mainly to hidden anti-tank guns and infantry Panzerfausts. German tanks and self-propelled guns were fewer in number, but generally better armed. 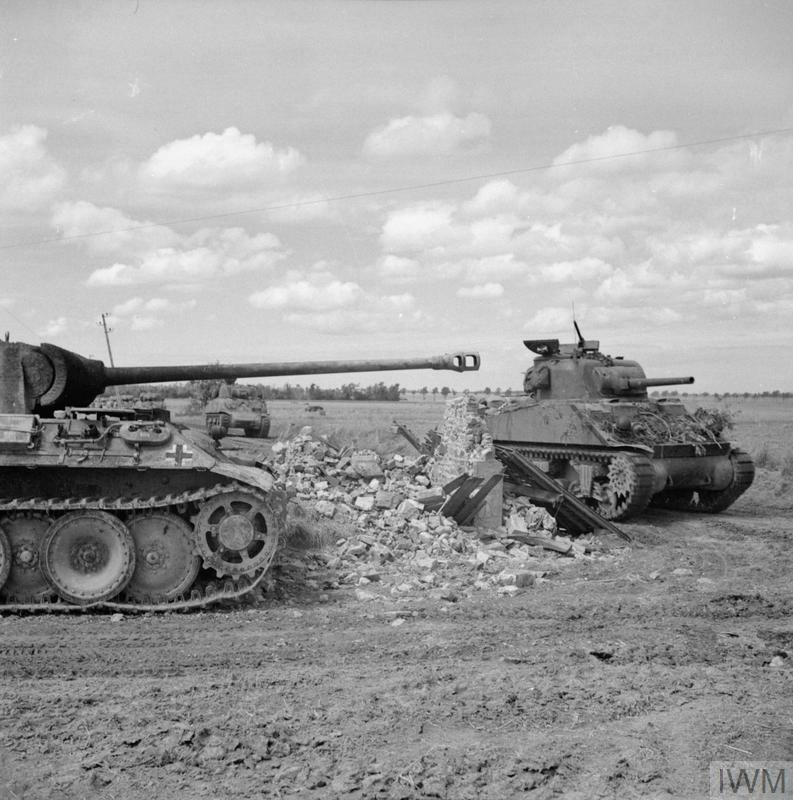 Vehicles such as the Panther and Tiger were far better armoured than the Sherman and Cromwell. British tank crews bemoaned their lack of protection and hitting power. Operation 'Epsom', which began on 25 June, was another attempt to outflank Caen and force a German withdrawal from the city. Once again, the patchwork terrain of small fields, sunken lanes, streams, and dense hedgerows slowed the advance. The Germans, defending in depth as usual, used the network of ancient fortified villages to bolster their positions. There was no breakthrough, and British losses were heavy. 15th (Scottish) Division, leading the assault, lost 2,331 killed, wounded or missing. 'Epsom' was subsequently re-branded by Montgomery as a successful plan to fix and wear down the enemy, even if it failed to gain ground. Enemy losses were indeed significant, mostly suffered during counterattacks against the bridgehead. German tanks and infantry on the offensive were no less vulnerable to anti-tank guns and artillery fire than their British counterparts. 'Epsom' drew in elements from six Panzer divisions, including formations newly-arrived from the east, and disrupted plans for a major German push against Bayeux. Unable to outflank Caen, Montgomery was in the end forced to take it by direct assault from the north. Operation 'Charnwood' went in on 8 July, on a wider front this time to dissipate the effects of German mortar fire. It was preceded by a massive aerial bombardment of German positions north of the city, which did little other than reduce much of Caen to ruins. 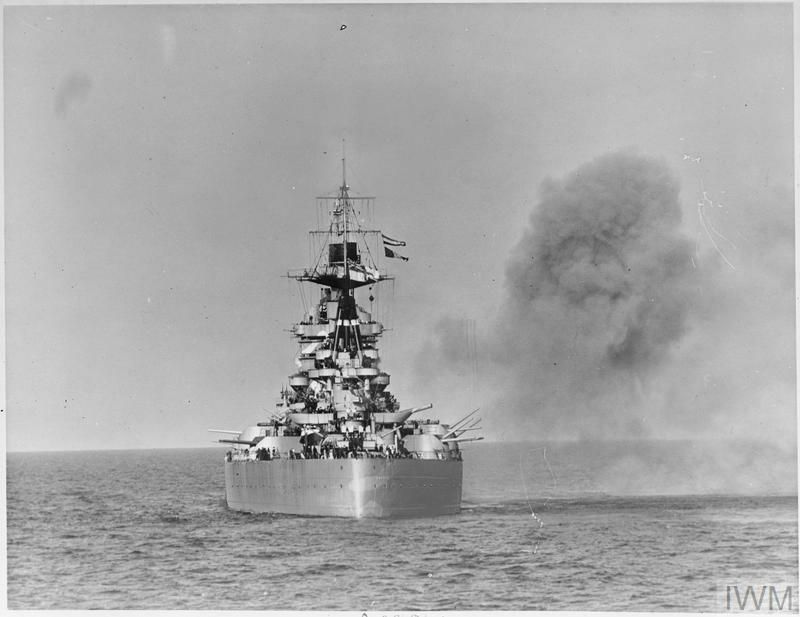 More successful were the guns of HMS Rodney, which broke up a German counterattack. As usual, the infantry battalions took heavy losses. 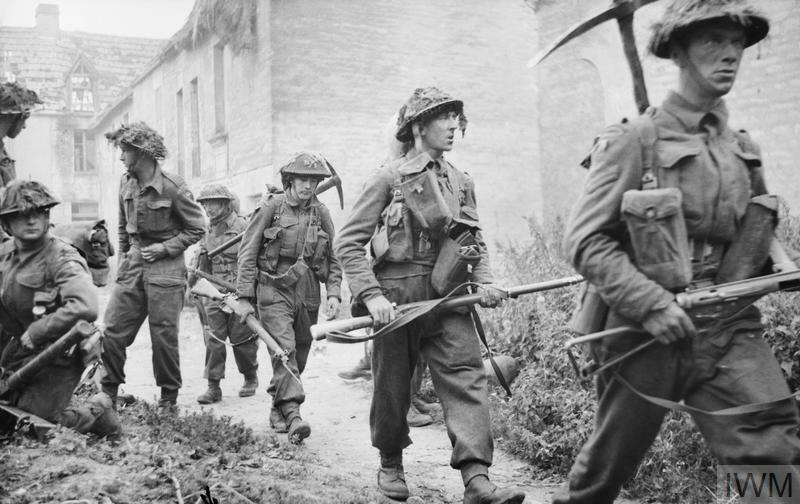 The three day assault liberated much of the city but resulted in 3,817 British and Canadian casualties. Some battalions suffered their heaviest losses of the campaign. Strategically, however, Monty was winning the battle. The Germans were incurring unsustainable losses. 'Epsom' and 'Charnwood' convinced the German High Command that there was no longer any realistic chance of driving the Allies back into the sea. With the Panzer units having to be used piecemeal to contain each British assault, a major armoured counter-offensive was out of the question. All the Germans could do now was to hang on and exact as heavy a toll as possible. Second Army's rifle companies were indeed being consumed at a fearsome rate, more so than had been expected based on predictions from campaigns in the Mediterranean. Such was the crisis that some existing formations had to be broken up to supply replacements for other units. 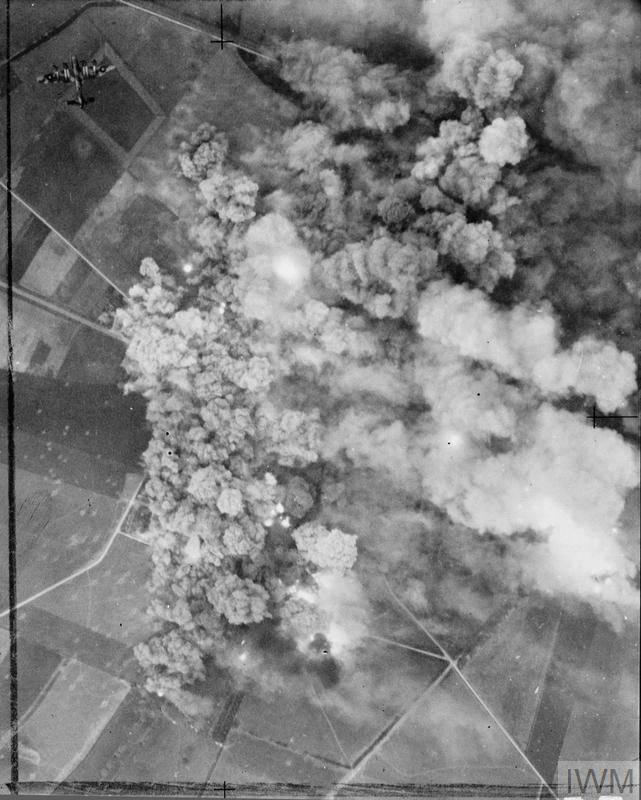 Bombs exploding on German positions around Cagny at the start of Operation 'Goodwood', 18 July 1944. A Lancaster, one of 927 RAF heavy bombers involved in the attack, can be seen in the top left of the photo. Over 6,800 tons of bombs were dropped by RAF and USAAF aircraft on five fortified villages east of Caen. The need to conserve his infantry led Monty to seize on a plan suggested by Second Army's commander, Lieutenant-General Miles Dempsey, to exploit southwards from Caen with three British armoured divisions. Operation 'Goodwood', launched on 18 July, was something of a gamble, relying on tanks rather than infantry to make the initial assault. The attack was preceded by a massive aerial bombardment, after which the armoured regiments pushed deep into enemy territory. Inroads of up to seven miles were made into the German defences, but the tanks could not break through. The lead regiments took heavy losses. 314 tanks were knocked out, of which 140 were destroyed. Deficiencies in infantry-armour integration were again apparent, as the tanks outran their support and suffered at the hands of German tanks and anti-tank guns. Ironically, given Montgomery's desire to spare his infantry, secondary operations by the three infantry divisions on the flanks of the advance outweighed those of the armoured divisions (2,710 compared to 1,149). The rate of loss in the infantry battalions was 9% – twice that of the armoured regiments. 'Goodwood' may not have been the breakout so desperately wanted, but it kept the bulk of the German forces in that sector. So when US forces launched Operation 'Cobra' on 25 July they faced only eleven weak divisions with limited fighting power. 'Cobra' broke the front open southwards from Saint-Lô, and American forces began a headlong advance westwards into Brittany and eastwards towards the Seine. The Germans had kept Allied forces bottled up for six weeks. But in so doing they had reduced themselves to remnants, devoid of reserves and unable to withstand the breakout when it came. To support the US advance, Montgomery launched Operation 'Bluecoat' on 30 July, a big push south-eastwards from Caumont in the west of the British sector. Sensing a turning point, his orders to Dempsey were to 'throw caution overboard… accept any casualties, and to step on the gas for Vire'. With infantry in short supply, 11th Armoured Division led the assault. 'Bluecoat' saw savage, costly fighting in the worst Normandy bocage terrain. But tank-infantry co-operation was continuing to improve, and now troops embarked as riders on the tanks themselves, ready to jump off and deal with enemy positions. The superiority of German armour was illustrated again when three Jagdpanther tank destroyers knocked out 11 Churchill tanks of 3rd Scots Guards on Hill 226. But isolated setbacks could not stop Second Army making good progress. By 7 August the Germans had been driven back to the River Orne, and the highest point in Normandy, Mont Pinçon, captured. Furious counterattacks by SS troops inflicted heavy casualties. Another Churchill-equipped regiment, 107th Royal Armoured Corps, lost 22 of its tanks while supporting 59th Staffordshire Division. As ever, British artillery support was pivotal in crushing the German attacks. 'Cobra' and 'Bluecoat' precipitated a collapse of the German position in Normandy, accelerated by Hitler's insane order for an armoured counter-offensive against the Americans at Mortain. 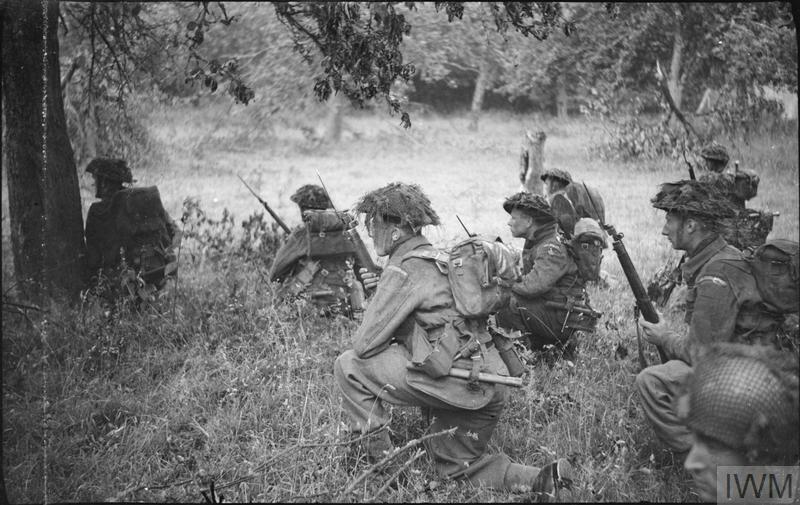 The newly-activated Canadian First Army launched a series of attacks south from Caen towards Falaise. The first of these, Operation 'Totalise' on 7/8 August, saw further tactical innovations in order to achieve surprise and reduce losses from German anti-tank guns. It began with a unique night-time advance to infiltrate enemy territory, followed by a massive bombing raid on the remaining German defence lines. The infantry were carried alongside the tanks in new armoured personnel carriers. At last, these most vulnerable of assets were being afforded a measure of battlefield protection and mobility. The first phase of 'Totalise' achieved a penetration of the German front five miles wide and four miles deep at a cost of only 380 casualties. German counterattacks were beaten off, but the advance then slowed, largely owing to the inexperience of the Canadian and Polish armoured Divisions and the increasingly desperate German defence. 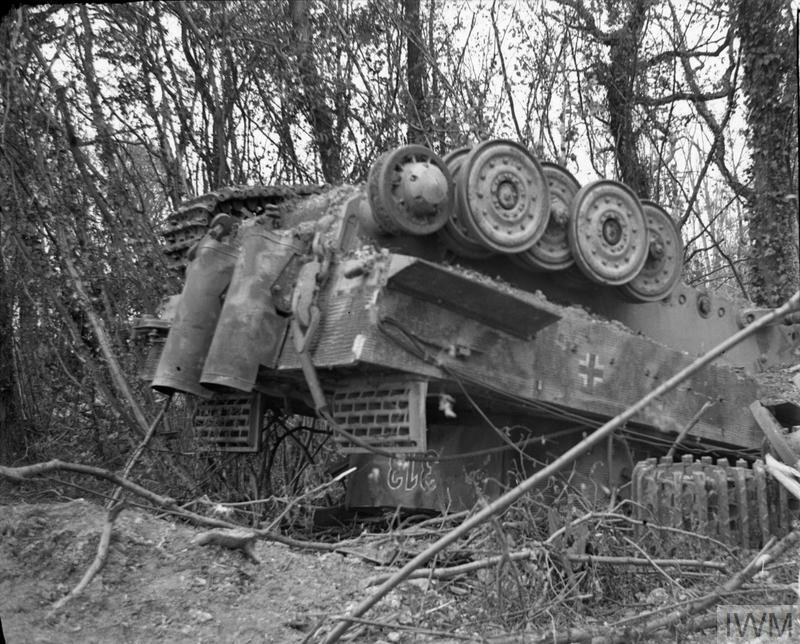 A German Tiger tank (weighing 56 tons) from the 503rd Heavy Tank Battalion blown upside down during the Allied bomber attacks that preceded Operation 'Goodwood'. Despite the devastation caused by the bombing, most of the battalions's Tigers escaped serious damage and by the end of the day had knocked out 40 British tanks. Nevertheless, by mid-August the Germans were in full retreat, and Allied victory was now assured. As Second Army continued its push south-eastwards, Montgomery and the commander of US forces, General Omar Bradley, made plans to trap what was left of the German forces between Canadian First Army in the north and American forces pushing up from the south. After bitter fighting with German troops seeking to extricate themselves from the pocket, the 'Falaise Gap' was finally closed on 21 August between Trun and Chambois. 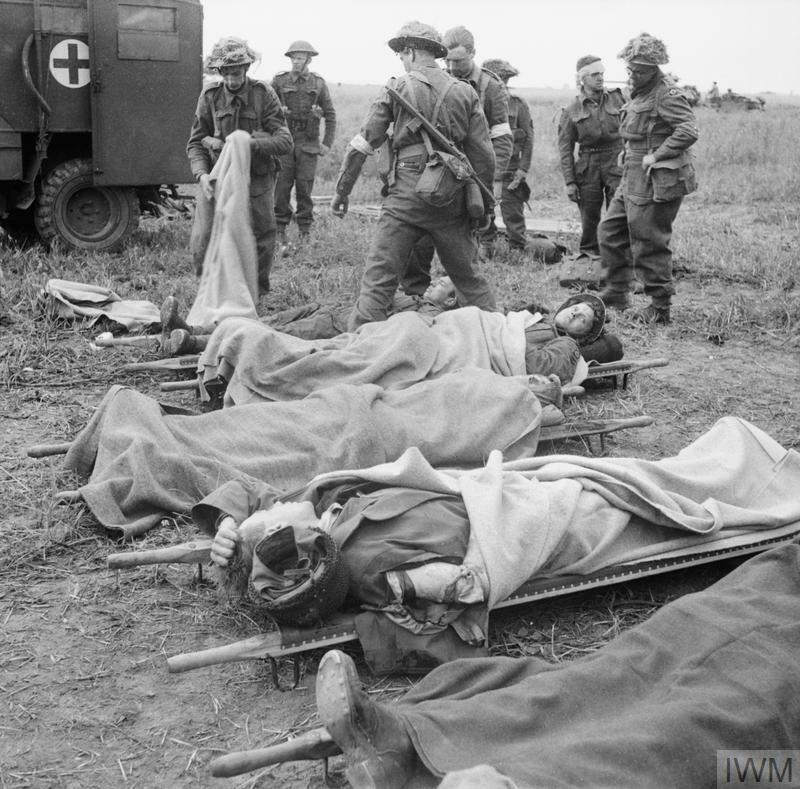 Normandy was one of the most intense campaigns ever fought by the British Army, with casualty rates at times rivalling those of Passchendaele in 1917. While overall losses did not exceed War Office predictions, their distribution caused grave concern. All seven infantry divisions that fought in Normandy had lost three-quarters of their initial strength by the end of August. The rifle companies had been the hardest hit. Though they formed no more than 20% of the whole, they had taken 70% of the casualties. In an echo of the First World War, junior infantry officers had a mere 1 in 10 chance of surviving unscathed. The principal reason was that the Germans did not fight as expected. The Allied aim had been to quickly break out of the bridgehead established on D-Day and fight a mobile battle inland. Instead, the Germans chose to dig in around the lodgement area, making use of the defensible terrain and their undoubted combat skills to contain any advance. In such conditions, Allied firepower was not always the answer. 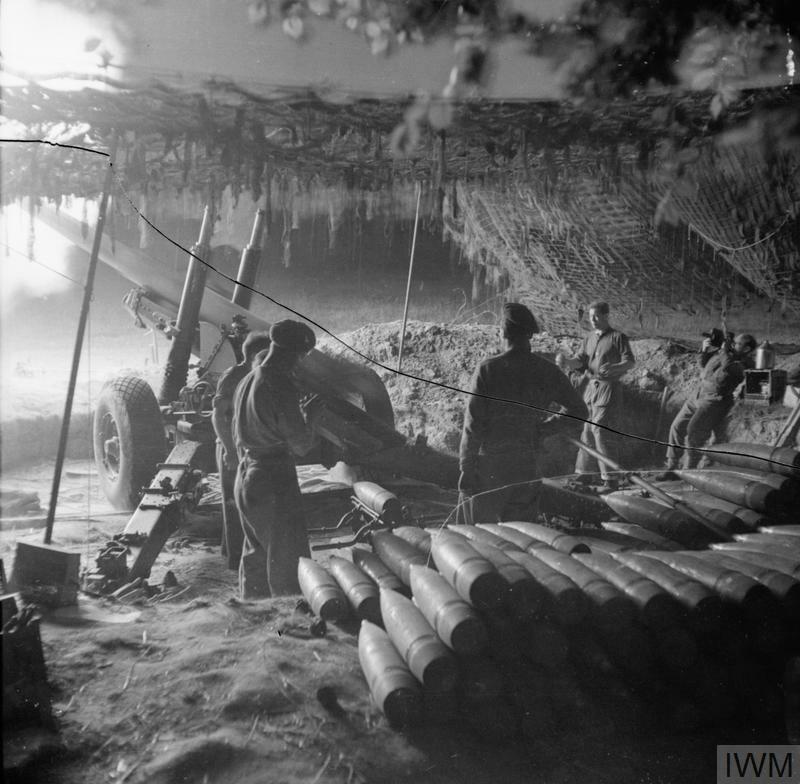 British artillery was vital for suppressing movement and breaking up German counterattacks, but less effective against troops in heavily fortified positions. Air power was more successful at interdicting German supply convoys and the movement of reinforcements than knocking out tanks in camouflaged, hull-down positions. On many occasions British tanks failed to achieve their objectives, thanks to the difficult terrain and weaknesses in armour and firepower. All of which placed the burden onto the infantry. At times, British formations exhibited more caution than may have been warranted. Troops were often only too ready to 'go to ground' and call in artillery support even when facing fairly limited opposition. They were never as adept at exploiting local successes as the Germans, who excelled at quickly retaking ground. 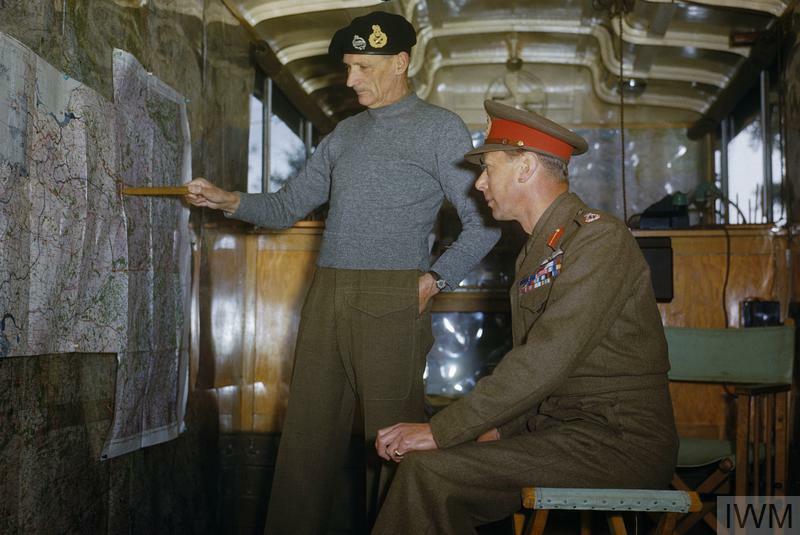 Montgomery himself urged his commanders to exhibit greater drive and flexibility, and some were sacked for failing to do so. Many German troops and commanders fought with a zeal and fanaticism alien to the citizen soldiers of Second Army. Montgomery's preference for properly planned and supported set-piece attacks was born of an understanding of all these factors, but against such a skilled and determined enemy casualties were bound to be high among the frontline troops. What mattered was to win the battle at tolerable cost. 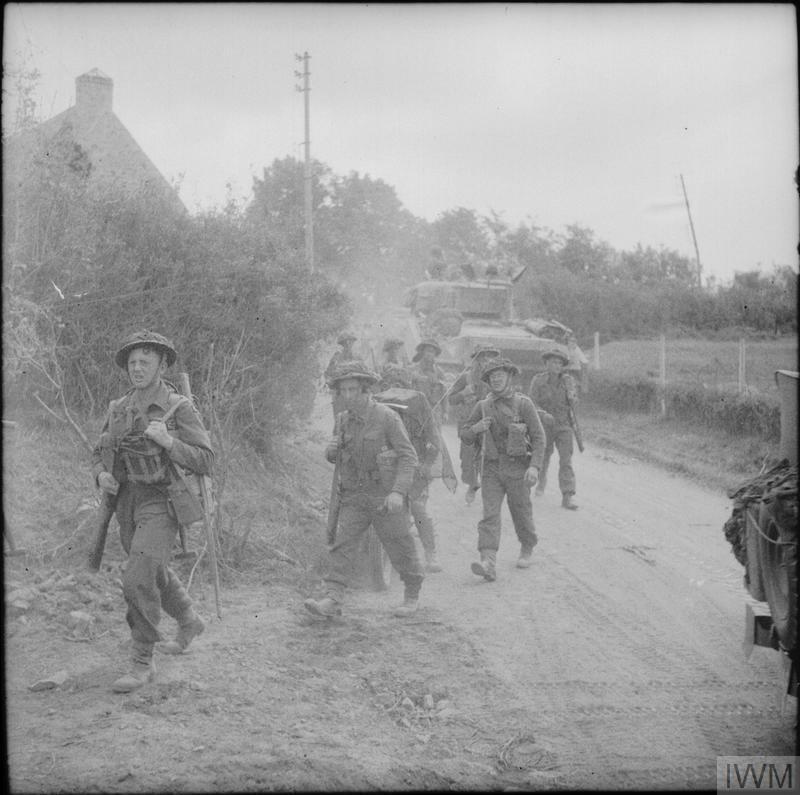 The British Army took on the bulk of the German Army in Normandy and prevailed. Unable to fight a war of manoeuvre for which it had trained, it adapted to a costly battle of attrition. Air power, artillery and materiel were of course vital to its success, but in the end it was generalship and the resilience of the troops at the sharp end that brought victory. On 6 June 1944, D-Day, Allied troops landed on the coast of Normandy. It was the start of the campaign to liberate Europe and defeat Germany. The Battle of Normandy was a hard-fought campaign. British divisions bore the brunt of German resistance on the eastern flank of the front, enabling US forces to stage a breakout in the west.